The garden is begining to bust out the wax beans which means I get to try out some fun new recipes. Of course I turned to my favorite cookbook- Pinterest - for ideas. I found this incredible recipe and I had almost everything with the exception of the green onions and parsley - so I just omitted them and I didn't have dijon mustard which I substituted regular yellow mustard. It was incredible! If you like tomatoes, goat cheese and wax beans, I think you should definitely make this. The best part - Ward is not a fan of goat cheese or tomatoes so it was ALL MINE! Next up, I was inspired by Heather's Eggplant Mushroom Lentil Burgers the other day, but wasn't feeling the burger part. So I opted to make an Eggplant, Mushroom, Roasted Red Pepper Pizza instead. I had two pizza crusts to use up so I made the kids a cheese one and made myself the delicious pizza. Ward was missing, so he completely missed out. 1. First I sauted the eggplant and mushrooms in the olive oil and sprinkled some salt on top. This part took maybe 5 minutes. 2. Then I topped the eggplant/mushroom combination onto of the pizza crust, spread some roasted red peppers and sprinkled some cheddar cheese on top. 3. Then I baked it for about 10 minutes and then inhaled this pizza. It was THAT good! I forgot to mention that the pizza was last night's dinner. 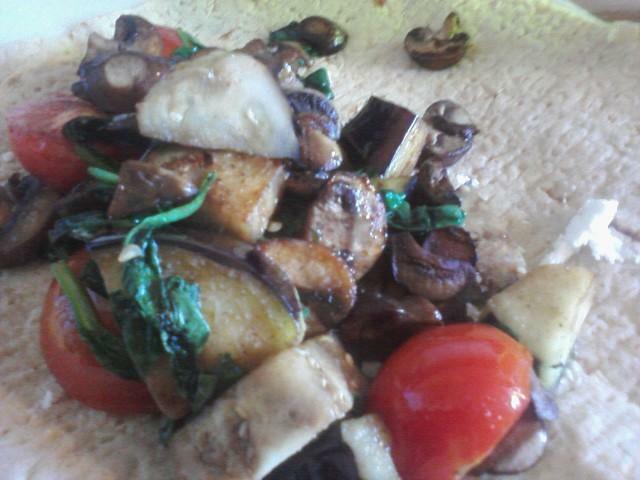 I still had a 1/2 of that eggplant and the 1/2 of bella mushrooms to use up, so I opted for a wrap for my dinner tonight. 1. Again, I sauted the eggplant and mushrooms but in coconut oil tonight. Then I added in the spinach and tomatoes for the last couple of minutes. 2. Next I spread out some goat cheese on the wrap and then scooped out the mixture from the pan and put on the wrap. Again, wow! This was incredibly easy and delicious! I should have grown some eggplant in the garden. Next year. For sure. Thank you Heather or the inspiration! Both of my dinners were delicious. I LOVE goat cheese, but I'm a wax bean virgin... time to try it! Mmmm... That husband of yours doesn't know what's good. It all looks delicious! That all looks delicious. I think I'll have to pick up some eggplant the next time I'm at the grocery. Haven't had that in forever! Left over wraps are the best! Did that recently with eggplant and lemon-spinach salad. Was so good. Yum the pizza looks amazing!! Let's Sweat Pink, Shall We?